Strengthen your tendons, improve your posture, boost your qi power, and transform your body from the inside out! Spring is a perfect time to add the Shaolin form called Yi Jin Jing into your weekly training schedule. Yi Jin Jing is a time- tested hard qigong method that uses tense and release postures combined with a hissing breath. This generates an enormous amount of qi power and healthy circulation through the tendons and joints. The practice has 2 versions: Short Form for Beginners and Long Form. I suggest you start with the Short Form 3 times/ week the first week and then practice the Long Form 3x/week for 2 more weeks. After 3 weeks of dedicated practice you will notice a dramatic change in your tendon power and increase in physical strength and stamina. NOTE: A $15/MONTHLY SUBSCRIPTION GIVES YOU ACCESS TO ALL OF THE VIDEOS IN THIS VIDEO LIBRARY. The practice has 2 versions: Short Form for Beginners and Long Form. I suggest you start with the Short Form, 3 times/ week the first week and then practice the Long Form, 3x/week for 2 more weeks. After 3 weeks of dedicated practice you will notice a dramatic change in your tendon power and increase in physical strength and stamina. The Tao and Chinese medicine believe that the state of our emotions is directly linked to the state of our health. If we hold on to negative emotions this creates stress on the body and harms the internal organs. The Six Healing Sounds are specific vibrations that help transform negative emotions into positive virtues. The method is a purging technique that can be used for clearing the body of toxins, stress and creating long lasting transformation on the cellular level. The Six Healing Sounds Method (Liu Qi Fa) dates back to the 4th century AD. The practice is recorded in the Record of Longevity and Nourishing Life (Yang Sheng Ming Lu) by Tao Hong. There are many applications and interpretations of the sounds. 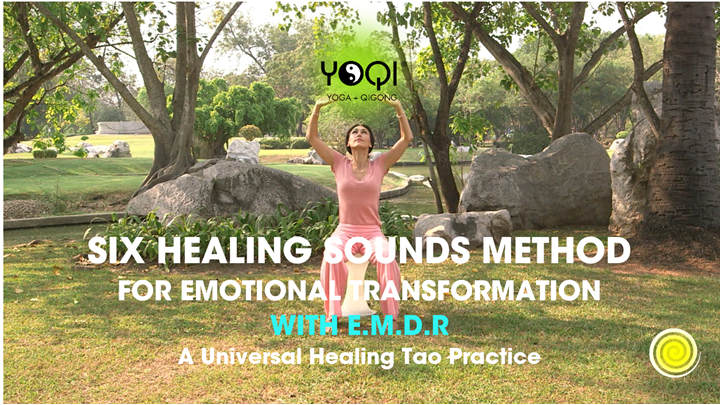 This version of the The Six Healing Sounds Method comes from the Universal Healing Tao system of qigong developed by master Mantak Chia. This is the EMDR (Eye Movement Desensitization and Reprocessing) version of the form currently taught at Tao Garden and is a fundamental practice in the U.H.T. training program. The Six Healing Sounds Method (Liu Qi Fa) dates back to the 4th century AD. The practice is recorded in the Record of Longevity and Nourishing Life (Yang Sheng Ming Lu) by Tao Hong. There are many applications and interpretations of the sounds. 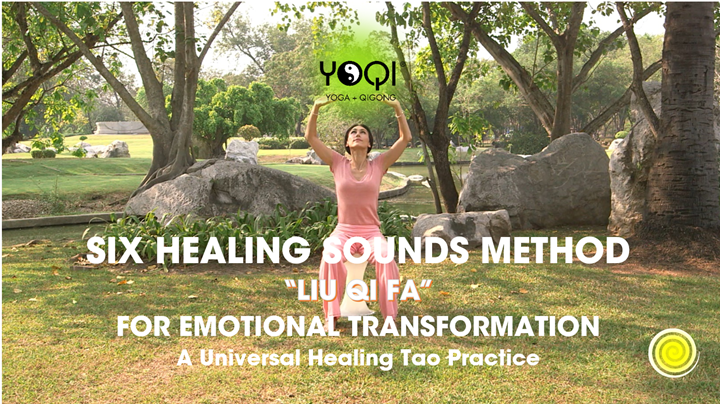 This version of the The Six Healing Sounds Method comes from the Universal Healing Tao system of qigong developed by master Mantak Chia. It is the simplified version of the form and a fundamental practice in the U.H.T. training program. The most important qigong exercises for spring are to purge. This is because the dominant organ of spring is the liver, our largest digestive organ of detoxification. Purging exercises are used to cleanse the body of acquired qi and to release qi stagnation. We commonly acquire qi from toxins in food, medications, air pollution, negative emotions, old emotions, low energy situations, electromagnetic radiation (especially if you fly a lot). This season's purging routine focuses on purging the liver and gall bladder organs using three of the most powerful methods of detoxification: twists, breathe and the 6 Healing Sounds. Nearly everyone can benefit from purging exercises. Those who should not do purging qigong are those who are seriously ill and have weak or deficient qi. When the qi is weak, the body is focused on healing so it's not a time to detox, its a time to tonify. Although the primary practices for spring are purging, tonification is an important next step. To tonify means to strengthen. Tonification qigong exercises nourish the organs, smooth the flow of qi through the meridians and fortify the qi in the lower dantian. Spring is an important time to tonify the liver. In Traditional Chinese Medicine, the liver is called the general of the army. It's job commands a smooth flow of blood and qi though the body. Tonification exercises help the general to carry out it's job to move good qi throughout the whole system, giving us a natural daily dose of energy and stamina. This routine introduces a classic Taijichuan coiling set of movements that are simple and gentle, yet profoundly energizing. At the end of the routine we top up our practice with the iron shirt form of tree posture. This activating standing meditation generates heat, cleanses impurities, tonifies the qi and uses the structural principle of inner spirals to increase qi in the body. Circulation qigong exercises irrigate the meridian pathways, nourish the tissues, energize organs, recycle energy, build internal power and strength. Circulation qigong flows may be the most fun, but actually they are an advanced form of practice and require that our state of health be in a stable condition. Before circulating is important to cleanse the body and make sure that there is an ample amount of qi in the lower dantian. For most people, doing a few purging and tonification exercises are a sufficient way to prepare the body for circulation. Spring flows move qi through the liver meridian and embody the spirit animal of spring, the dragon. The dragon represents transformation, a powerful force that uses spirals to refine and direct energy flow. The Spring Circulate routine focuses on the liver and spinal cord to awaken our inner dragon and "set the dragon free", ultimately cultivating the life giving virtues of self love and compassion. This complete qigong flow routine is designed to purify, nourish and balance the liver and gall bladder. Inspired by the ancient swimming dragon style of qigong this flow uses spirals and twists to release tension, detoxify the liver, nourish the tendons and get the qi flowing. In Traditional Chinese Medicine the liver resonates with the wood element and are most influential in the season of SPRING. Cultivating your internal wood energy creates resiliency, compassion and a happy and healthy liver. Physically this routine is perfect for detoxification and longevity. Energetically this routine is great if you are seeking new perspectives and personal growth. So enjoy the scenery of the Northern California Redwoods and let's move some qi! Meridian tapping (pai da) is an external qigong method for detoxification. The vibrations of the tapping shake toxins out of the facia, muscles and internal organs. It improves the nervous and lymphatic systems, while strengthening the skin and muscle tone. Tapping also increases qi pressure so that the organs, bones and glands can absorb more energy. In this routine we will add the internal qigong method of detoxification called the Six Healing Sounds. This combination of both internal and external vibration creates a powerful purging practice that works on the physical, emotional and energetic levels. This method of tapping is a Universal Tao form designed to detoxify the body. This level one form prepares the body for more advanced hitting practices that include packing qi with bone compression. One of the characteristics of this practice that I enjoy are the pauses between tapping to feel the qi and allow the vibrations to settle in. There hundreds of qigong exercises to clear and transform stress, especially purging exercises. Anxiety is more intense level of stress and has a different biological effect on the nervous system. Many people can function in a stressed state, some people can even thrive in it for a while, but anxiety is a different ball game. It is pure embodied fear and has consequences on the heart and liver. So how do we transform fear back into love? This complete Qigong Flow routine combines the best of qigong to transform stress and anxiety back into vitality. The sequence uses sound, breath and tension and release exercises. There hundreds of qigong exercises to clear and transform stress, especially purging exercises. Anxiety is more intense level of stress and has a different biological effect on the nervous system. Many people can function in a stressed state, some people can even thrive in it for a while, but anxiety is a different ball game. It is pure embodied fear and has consequences on the heart and liver. So how do we transform fear back into love? This complete Qigong Flow routine combines the best of qigong to transform stress and anxiety back into vitality. The sequence uses sound, breath and tension and release exercises and finishes with gentle easy flowing movements. The energy of spring supports growth, expansion, vision and creativity. In Taoist metaphysics, these virtues resonate with the spirit of the liver, called the Hun. The Hun spirit shines through our eyes and gives us the energy to put things into perspective; to see the big picture. So spring a good time to break free from old programs, open to new ideas and set our Hun free. It's also a prime time to take new ideas and make them into practical plans. In this routine we explore the ability to focus on specific goals then relax and let things unfold naturally, at the same time. This standing flow is meant to be paired with the Energy Reboot Meditation, a powerful seated qigong that uses Dantian Activation and Meridian Tapping to realign your energy system and break free from patterned behaviors. Through this process of actualizing the Hun, we come realize that the largest perspective includes the highest good of all beings. The weather pattern and pathogen associated with winter is cold (han 寒). Our winter purge and cleanse practices are a series of invigorating qigong exercises that move stagnation, warm the internal organs (especially the kidneys) move the blood and warm the qi in the xia dantian, the lower dantian. We’ll also use pai da, tapping, to open key acupressure points on the kidney and bladder meridian to unblock and open our internal energetic pathways creating a sense of relaxation and inner peace. Movements focus on cleansing the kidneys and bladder as well as clearing and strengthening the wei qi field to prevent colds and flus. Practice purging qigong on days when you feel extra tension in the body, stress, emotional imbalance, fear, cold hands and feet, lethargic, or have stiffness in the muscles and joints. To tonify means to strengthen, support and nourish the qi. In Chinese this is called Yang Qi Fa (Nourish Qi Method). Because winter corresponds to the kidneys and the kidneys store our reserve qi, it is an important time to "nourish the storage" and give extra support to the kidneys, and the blood. The energy point on the body for nourishing the kidneys is the mingmen or life gate. The ming men is like a switch that regulates the flow of vital qi through the body and balances the kidney yin and kidney yang energy. The mingmen and the lower dantian are closely related: any exercise that builds the energy of the dantian also strengthens the ming men. Therefor our tonification exercises this season are slower and gentle meditative movements that focus on building internal energy in the lower dantain and mingmen. A nap or still meditation after this practice is highly recommended. When should I choose to do a tonification routine? Note: A monthly subscription to the video library gives access to all of the videos in the library. The element of winter is water. Water has the tendency to sink downwards, expressing winters energy of closing and storage. Recent studies on bio-electricity pose the theory that qi is conducted through the water-gel substance that connects our tissues, called fascia. When our body is fluid and water flows, we are healthy and full of qi. If our internal waterways become stagnant, illness arises. Circulation qigong use flowing movements, breath and mental intention to nourish the tissues, energize organs, recycle internal energy, refine the qi and irrigate the meridian pathways. One interesting side effect you may notice after qigong and meditation is an increase of saliva in the mouth. This is a good sign of qi circulation! The energy in our bodies flows through numerous channels called meridians. The meridians can also be likened to rivers. The mother of all rivers is called the Central Meridian Channel (Zhong mai). I It is the main conduit of energy in our energy system. The Central Meridian channel runs through the core of your body from the crown of the head through the pelvic floor to the earth. This line was formed at conception. It is called the primitive streak. When energy flows freely through the central meridian channel all its tributaries benefit. In our Winter Series Circulate routine, we focus on circulating qi through the central meridian channel. Then we will direct the flow through the kidney and bladder meridians. The routine finishes with the Small Heavenly Circuit, moving energy through the du mai and ren mai. When should I choose to do a circulation routine? Circulation routines are a more advanced form of qigong practice that ultimately uses the mind to guide the qi. Choose circulation practices when you have an ample amount of qi and are ready to raise and refine your frequency. In other words, circulate when you feel good and have fun doing it! Your body should be internally cleansed and balanced before circulating energy. There should also be an ample amount of qi in the lower dantian before doing circulation practices. If you feel tired or weak, it is not a time to circulate qi, unless advised by your personal TCM doctor or qigong teacher. The exception to this is the microcosmic orbit practice which helps cleanse, balance and refine the qi. It is still advised to cultivate sufficient qi in the lower dantian before doing the microcosmic orbit on a regular basis. (39 minutes) The energy of winter is closing and storage. All of nature becomes still and is in a state of hibernation. Therefor its also time for us to conserve our energy, reflect inwards and cultivate our true nature. Of all the qigong practices for winter, meditation is the most suitable. The foundation of all meditation is cultivating awareness. This awakening awareness meditation uses a skillful sequence of observation techniques based on the 5 senses and organs of perception. At the end of the meditation we finish with self massage to nourish our qi. (36 min) This qigong flow routine is designed to help you relax from your day and create the right conditions for a restorative sleep. In the evening our energies are winding down in harmony with the descending energy of nature. So it’s a good time to turn our energy inward, calm the emotions and recollect the spirit. In traditional Chinese medicine the heart is the ruler of sleep. The heart is considered our emotional mind and is houses the shen our spirit. If our emotions are over active they say that the shen or our spirit is not centered in the body, then this can make it difficult to sleep. So in at night we want the mind and the heart to be calm or yin. We want to calm the heart spirit and balance the yin and yang energy in the body. The routine begins with exercises to release any accumulated energy you may have taken on in your day. Then we will do spiral movements to clear out stress and anxiety that may be affecting the heart shen. Then we will do some restorative qigong for the kidneys to replenish our vitality. Finally well finish with some special exercises to promote a good nights sleep. (46 min) This qigong flow routine is designed to help you relax from your day and create the right conditions for a restorative sleep. In the evening our energies are winding down in harmony with the descending energy of nature. So it’s a good time to turn our energy inward, calm the emotions and recollect the spirit. In traditional Chinese medicine the heart is the ruler of sleep. The heart is considered our emotional mind and is houses the shen our spirit. If our emotions are over active they say that the shen or our spirit is not centered in the body, then this can make it difficult to sleep. So in at night we want the mind and the heart to be calm or yin. We want to calm the heart spirit and balance the yin and yang energy in the body. The season of autumn supports our ability to go with the flow and cultivate our inner virtues of courage, righteousness and inspiration. This Autumn qigong flow to circulate routine is designed to move qi through the lung meridian while training the body to move with effortless flow. Do this routine after you have already warmed up the body with some yoga, exercise or purging/tonification qigong practices. Circulation qigong also is beneficial to do before seated meditation. This complete qigong flow routine is designed to purify, nourish and balance the lungs and immune system. In Traditional Chinese Medicine the lungs are the "commanders of qi", they are foundation of our vitality and a healthy immune system. In five element theory, the lungs resonate with the metal element and are most influential in the season of AUTUMN. Inspired by the Chinese spirit animal of the lungs, the tiger, this flow uses invigorating warms ups, healing sounds and flowing movements to access your internal power. Shot on the helicopter landing pad on top of a high rise building in Bangkok! Enjoy the scenery and let's move some qi! NOTE: A monthly subscription gives you access to all of the videos in this Video on Demand library. New videos are added every month. You can cancel your subscription any time your wish. In Traditional Chinese Medicine the lungs are the "commanders of qi", they are foundation of our vitality and a healthy immune system. In five element theory, the lungs resonate with the metal element and are most influential in the season of AUTUMN. Inspired by the Chinese spirit animal of the lungs, the tiger, this flow uses invigorating warms ups, healing sounds and flowing movements to access your internal power. Shot on the helicopter landing pad on top of a high rise building in the city! Enjoy the scenery and let's move some qi! The season of autumn supports our ability to let go and go with the flow. The session begins with self massage and meridian tracing to activate the lung and large intestine meridian pair to boost the immune system, prevent allergies and open our channel to let go. The meditation works through letting go on 4 layers: body, emotions, mind and the lung spirit. NOTE: BY SUBSCRIBING @ $15/MONTH TO THE YOQI VIDEO LIBRARY YOU HAVE ACCESS TO ALL VIDEOS IN THE LIBRARY. YOU CAN CANCEL YOUR SUBSCRIPTION STATUS AT ANY TIME YOU WISH. This YOQI YIN essential class is a signiture YOQI practice that combines Yin Yoga with Qigong with focus on the Taoist microcosmic orbit. The routine begins with neigong exercises to open and activate the orbit points. Phase two moves into yin yoga postures that focus on the spinal cord joints. The last phase of the routine uses a special breath technique called "xi breathing" followed by a seated silent microcosmic orbit meditation. The Microcosmic Orbit is a circular pathway of energy that runs up and down the spine. Moving energy through the orbit is classic Taoist meditation that balances yin and yang energy in the body, nourishes all 12 meridians, circulates and refines the qi. It is an essential qigong practice for internal energy transformation. Yin yoga effectively releases the fascia and promotes qi flow. It is a wonderful way to prepare the body for the microcosmic orbit meditation. The practice of Sān Tǐ Shì has been a fundamental qigong for centuries. The word Sān Tǐ Shì literally means “three body potential” or the Three Forces. The three forces are Heaven, Earth and Human. This practice is a standing meditation that is made up of 5 static holding postures. The postures attune your energy to these primary forces of nature through the combination of physical alignment, will power and relaxation. The Three Forces Standing Meditation is a training of your willpower. It cultivates focus, perseverance, sensitivity, and intention. This practice is great to do when you feel distracted, scattered or uncertain. It can help you to hold your ground, stop being pushed around, follow through with plans, stop procrastinating, initiate change and build resolve to overcome a difficult situation. Over time this practice will train you to develop concentration and confidence, ultimately plugging you in to your highest potential. This unique yin yoga routine is designed to embody the Four Brahamaviharas of Buddhism through posture, breath and recitation to create a high vibration state of being. The Brahmaviharas or "Four Abodes" are Loving Kindness, Compassion, Sympathetic Joy and Equanimity. When applied the Four Abodes can change your life. Marisa has a deep understanding of Buddhism through her 20 years of personal practice, academic studies in Comparative Religions at Long Island University and 1 year of participant observation in Buddhist monasteries in China, Taiwan and Thailand. She is happy to integrate these Buddhist gems into a full body experience. A complete qigong flow routine to purge, tonify and nourish the Spleen and Stomach. It is great for digestive health, boosting the immune system and cultivating energy in the lower dantian, our energy bank account. Details: A happy spleen is a stable spleen. In Traditional Chinese Medicine the spleen and stomach resonate with the vibration of the earth element and the season of PRE-AUTUMN, sometimes called "Indian Summer". The routine uses specific qigong movements that cultivate centering and grounding. Movements focus on breathing exercises, heaven and earth flows and energy ball techniques that activate the lower abdomen and nourish the stomach and spleen meridians. Shot in Joshua tree national park, California. This standing qigong session guided by Marisa and Buddhist Monk Venerable Pandit Bhikku is designed to be a slow, gentle and powerful moving meditation. The most fundamental qigong practice is to sense, feel and activate your lower dantian. When you train privately with a qigong master, most often you will spend the first 6 months just focusing on this one area of the body. In Part 2 of the series we focus on activating the lower dantian and circulating energy through the Microcosmic Orbit (The full Small Heavenly Circuit). The morning is the best time of day to cleanse the body and access the rising solar energy. 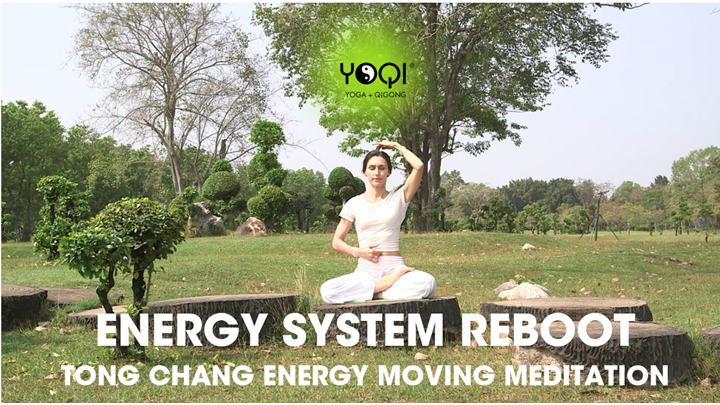 This dynamic routine combines qigong and yoga to cleanse the body, wake up the organs and prepare the your energy to take on your day full balanced, centered and energized. The morning is the best time of day to cleanse the body and access the rising solar energy. This dynamic complete qigong flow routine is designed to wake up the organs and prepare the body for the day. The morning is the best time of day to cleanse the body and access the rising solar energy. This complete qigong flow routine is designed to wake up the organs and prepare the body for the day. This routine is a slow-paced Qigong Flow that is designed to activate and integrate the three main energy centers of the body, The Three Treasures. The form is considered a Spiritual Qigong practice, because rather than focusing on the organs, elements and meridians for physical healing, the form works with our essential energies for self-realization. Qigong and yoga masters emphasize that the goal of all internal alchemy practices is the transformation of the body, mind and spirit leading to the full expression of your highest potential. To do this, the masters looked within and discovered that some parts of the body have more energy than others. They called these areas of the body dantian or elixir fields. There are three main dantian: the lower dantian, the middle dantian and the upper dantian. The precious energies that gather in the three dantian are the Three Treasures: Jing, Qi and Shen. The Three Treasures are the essence of our being and our connection to the Universal Forces. If we are out of balance or disconnected, these energy centers become weak. The most common imbalance is that one energy center will dominate over another creating an imbalance in the way we perceive ourselves and others. When the Three Treasures are full and integrated we feel empowered and have the energy to take our power and use it for the highest good of all beings. So, the intent of qigong practice is to continually replenish these energies as well as to refine the quality of their energy, like refining crude oil into high octane gas. When our Three Treasures are active and integrated we feel nourished, connected and completely fulfilled. The process of refinement is a full body transformation that integrates Jing into Qi into Shen. The Three Treasures Qigong Flow is the first step to activate these precious energies and learn to harmonize them through the central meridian channel. Note: A $15/monthly subscription gives you access to all the videos in the library. Click on any single video to subscribe to all videos. The element of the summer is Fire, but too much Fire or Heat disturbs the heart. In Traditional Chinese Medicine, when heat collects in one area of the body this is called “fire poison", otherwise known as inflammation. Summer, being the hottest time of the year, is prone to it's own two unique imbalances called Summer Heat and Summer damp. This can manifest in the form of physical heat and emotional heat. The Summer Purge routine focuses on exercises that clear heat, calm emotional heat and move the qi in the blood. The routine ends with gentle progressive loops that balance yin and yang energy in the body, creating a harmonious and balanced state of joy and calmness within. Summer is a powerful time to attune to the sun’s yang energy for expansion, joy and connection to the world around us. Our internal sun, called the Imperial Fire or Sacred Fire, resides in the heart center. To sustain a steady flame of fire for expansion, we need to first create an ample amount of energy in the body through tonification practices. When the sacred fire burns steady, expansion happens effortlessly and we feel joy and happiness for no reason at all. In this routine we begin by generating qi internally by “Warming the Stove”, a Dantian Activation sequence that uses dantian breathing and reverse breathing methods to conserve and activate the Original Force. This is followed by energy warm ups for the spinal cord and silk reeling exercises that nourish the kidneys (water element) and heart (fire element). The routine ends by collecting qi from the cosmic forces of Heaven and Earth through the Six Directions Flow, further energizing and tonifying the system. Circulation qigong exercises irrigate the meridian pathways, nourish the tissues, energize organs, recycle energy, build internal power and strength. It is suggested to build up qi sufficiently in the body before circulating it. For most people, doing a few purging and tonification exercises are a sufficient way to prepare the body for circulation, which are included in the beginning of this routine. Qigong circulation practices for the summer focus on cultivating the fire element; expanding your capacity to love and be loved. In this routine you will learn specific qigong flows that circulate energy through the blood, empower the heart center and balance yin and yang in the body.One of the keys to cultivating summer and accessing the heart energy is enjoyment and laughter. So have fun with it, and feel the qi flow! This routine is a 50 MINUTE special edition video for summer that is designed to tonify your energy by nourishing the Original Force internally and externally. We begin by generating qi internally with “Warming the Stove”, a Dantian Activation sequence that uses dantian breathing and reverse breathing methods. This is followed by energy warm ups for the spinal cord and silk reeling exercises that nourish the kidneys (water element) and heart (fire element). The routine ends by collecting qi externally from the cosmic forces of Heaven and Earth with the 3 Fires, 6 Directions and Opening the Microcosmic Orbit qigong form. The 3 Fires, 6 Directions and Opening the Microcosmic Orbit is a qigong form designed to connect with universal energy and transform it within our body. This technique trains the mind power to combine with qi power that is our birthright. The Three Fires refer to the fire energy of the universe within our body. They are the Dantian Fire, the Kidney Fire and the Heart Fire. The Dantian Fire is the absorption fire in the lower abdomen. The Kidney fire is the adrenal fire; it is the Yang within Yin. The Heart Fire is the Imperial Fire; it is the Yin within Yang. We are all born with a vital connection to the universe through these Three Fires, but as we age the fires can become weak. Activating the Three Fires awakens our connection to the primordial force that we are all born with and vitalizes our body-mind- spirit. The Six Directions trains us to expand awareness and open our qi to receive healing power from the Universe. Practicing this daily increases healing power. The Microcosmic Orbit (also called the Small Heavenly Circuit) is the body's major energy pathway that runs up the back of the body and down the front of the body. Opening the Microcosmic Orbit it an exercise that activates the points along the pathway to clear blockages and prepare for the Small Circulation of Light practice. The universe is an abundant source of energy. Thousands of years ago, pioneers of consciousness in China discovered how to tap into this energy. They discovered that we are born with cosmic power and that the way to tap into it is through our inner universe. The Three Fires and Six Directions is a qigong form designed to connect with universal energy and transform it within our body. This technique trains the mind power to combine with qi power that is our birthright. The Three Fires refer to the fire energy of the universe within our body. They are the Dantian Fire, the Kidney Fire and the Heart Fire. The Dantian Fire is the absorption fire in the lower abdomen. The Kidney fire is the adrenal fire; it is the Yang within Yin. The Heart Fire is the Imperial Fire; it is the Yin within Yang. We are born with a vital connection to the universe through these Three Fires, but as we age the fires can become weak. Activating the Three Fires awakens our connection to the primordial force that we are all born with and vitalizes our body-mind- spirit. This sequence is a Universal Healing Tao practice as currently taught by Master Mantak Chia at Tao Garden 2018. It is a foundational form that can be practiced in addition to other routines..
Take a journey into the depths of vibrational transformation to transform negative emotions into positive virtues while releasing tension and stagnation in the connective tissues. Gain more flexibility, clear out the old and open to new possibilities. This YOQI Yin routine skillfully combines archetype Yin Yoga postures with corresponding qigong healing sounds. You will learn how to make the sounds on all 3 levels: Ming (audible-physical) An (whisper-emotional) & Hua (silent-subconscious). Filmed in the So-Cal desert in an oasis of peace, fun and sun. Esta rutina completa de qigong está diseñada para purificar, nutrir y equilibrar el hígado y la vesícula biliar. Inspirado por el estilo antiguo del dragón de la natación del qigong este flujo utiliza espirales y giros para liberar la tensión, desintoxicar el hígado, nutre los tendones y consigue el qi que fluye. En la Medicina Tradicional China el hígado resuena con el elemento de madera. Cultivar su energía de madera interna crea resiliencia, compasión y un hígado feliz y saludable. Físicamente esta rutina es perfecta para la desintoxicación y la longevidad. Enérgicamente esta rutina es grande si usted está buscando nuevas perspectivas y crecimiento personal. Así que disfrutar del paisaje de las Secoyas del Norte de California y vamos a mover algo de qi! 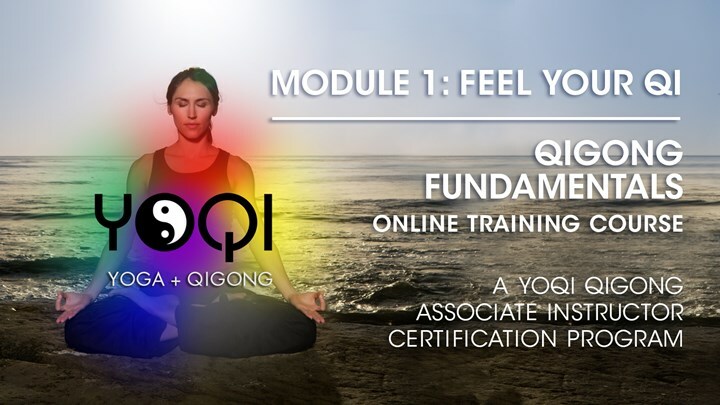 The YOQI Module 1 Training Program is an in-depth study into the practice of Qigong, Taoist Yoga, Pranayama, Buddhist and Taoist meditation. The course covers Qigong Fundamentals, and will train you in the most well-known and effective qigong methods for self-healing, stress reduction, energy enhancement, emotional balance and spiritual insight. Included in the course are lectures, tutorials, practice sessions, audio downloads and a PDF manual. Based on classic qigong forms and Traditional Chinese Medicine principles, the program follows the Six Energetic Phases of Qigong Flow, a method designed to train you how to effectively sense, feel, transform and work with qi (life force energy/prana) and teach others how to do the same. This course is required to obtain the YOQI Instructor Certification. NOTE: THERE ARE 6 SERIES AND OVER 70 VIDEOS IN THE COMPLETE COURSE. EACH SERIES WILL BE RELEASED OVER THE NEXT 3 MONTHS FROM FEBRUARY-MAY 2019. BEGIN NOW WITH THE INTRODUCTION SERIES. ONCE YOU PURCHASE THE COURSE, AN EMAIL WITH TIPS TO GET STARTED AND USE THE COURSE LIBRARY WILL BE SENT TO YOU.